In the idyllic Park Cities community of Dallas, up and coming artist, Taelor Fisher, is quickly making a name for herself. From gorgeous abstract florals to week night studio sessions, this Highland Park native is bringing a fresh vision and vibe to the Dallas art scene. Not only is she an extremely talented artist, she also happens to be one of my good friends and former coworkers! While she's always been an artist, it's only been in the last year that Taelor began growing her brand, Taelor Fisher Painting. She has beautiful pieces hanging in many local home interior stores and galleries as well as an extensive commission portfolio. 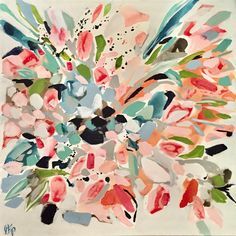 A contemporary abstract artist, Taelor's style has evolved over the year from a base of primarily monochromatic neutrals to a vibrant palette from which she creates striking abstract florals. Art teacher by day, and artist by night, Taelor is constantly immersed in the arts. 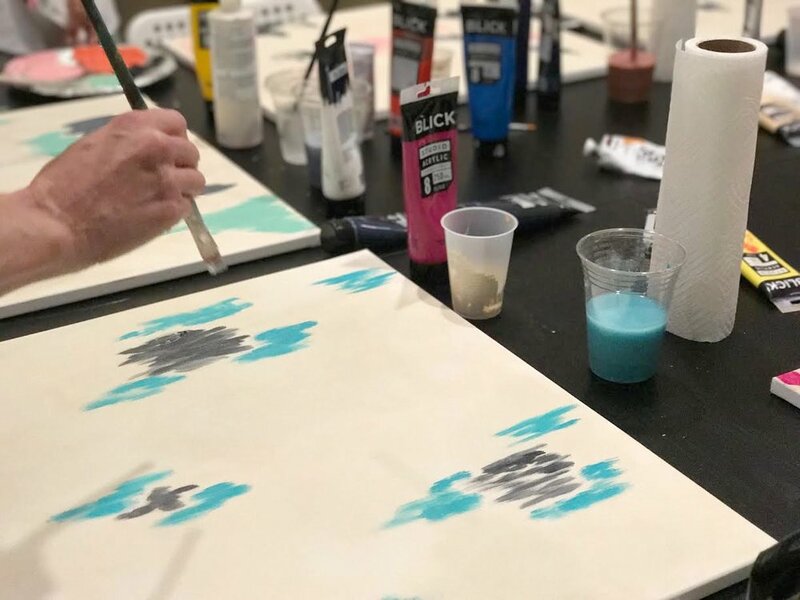 Tonight in the studio at ¡hola hp!, Taelor won't be instructing students, rather a group of Highland Park mom's who've signed up for a relaxing evening of painting. From the moment I entered ¡hola!, Taelor's presence was immediately visible in the form two of her beautiful florals hanging in the entry. Tucked inside a room that would be her studio for the night, Taelor had prepared the tables for the evening and displayed two examples of the style of art they would be working on. Lining the table were rows of acrylic tubes, cups with premixed fluid acrylic blends, and each person's palette and canvas for the evening. Once all of the women had arrived for the class, Taelor began introducing the contemporary artist, Robert Rea, from whom tonight's class would be styled around. In true teacher form, she featured key steps they would be taking prominently on the white board. Step one would be to create a wash of color on their canvas. As the women began creating a wash on their canvas to break up the harsh white, Taelor introduced them to some of her favorite products. Tonight they would be creating a wash in a fluid acrylic, Titan Buff. 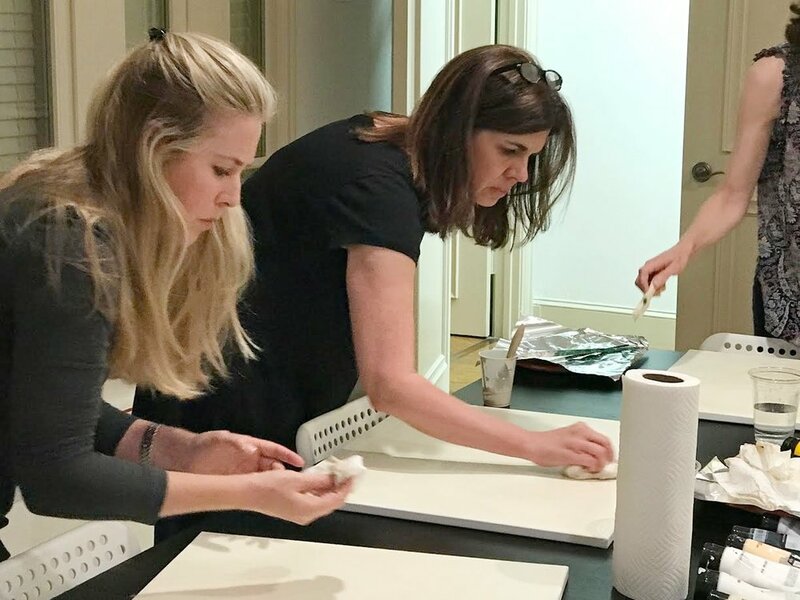 As they began to work, she highlighted a series of techniques to create a soft wash. Once the wash was complete, the difficult task of choosing a color scheme was up next. As everyone thought about the colors they'd like to use for their piece, Taelor shared a few of her favorite colors that she frequently uses in her own pieces. As I walked around the room, I was so intrigued by the variety of colors that the women had chosen! I was so impressed with the ease in which they chose their vibrant palettes of fuchsia, turquoise, orange, etc... I personally struggle to get outside of my soft neutral palette! It is my happy place and I envy their ability to approach bold colors with such confidence! Taelor modeled a few stroke techniques and placement ideas for the women, and then they all began to create their own unique piece. As they worked, conversation quickly circled back to their children and all of the haste of the end of the school year. As a new mom who rarely gets out of the house, it was so nice to be around other moms and hear about their children and life with kids ranging from two to twenty-two. As one mentioned her youngest was four, two chimed in about how much they loved that age. It immediately made me think of Stella and all of the fun to come! While they worked, I walked around and observed the unique style of each painting. Some struggled over their stroke or color choice and doubted their own ability, but Taelor was there to step in and offer assistance by providing tips and sharing techniques that she uses in her work. As each was nearing completion of their piece, Taelor brought out the metallic gold and silver paints that would add the finishing pop to each piece! As the evening drew closer to an end, I had to leave early to relieve my babysitter, so I said goodbye and left the group to finish their pieces! As I stepped outside, the sky was painted in the most beautiful shades of pink and orange. I found myself in a moment of calm and relaxation, a far cry from my usual Thursday night spent serving as a jungle gym to a vivacious toddler. It was such a wonderful way to spend an evening; surrounded by a wonderful group of women and mothers, enjoying great conversation and creating beautiful works of art! 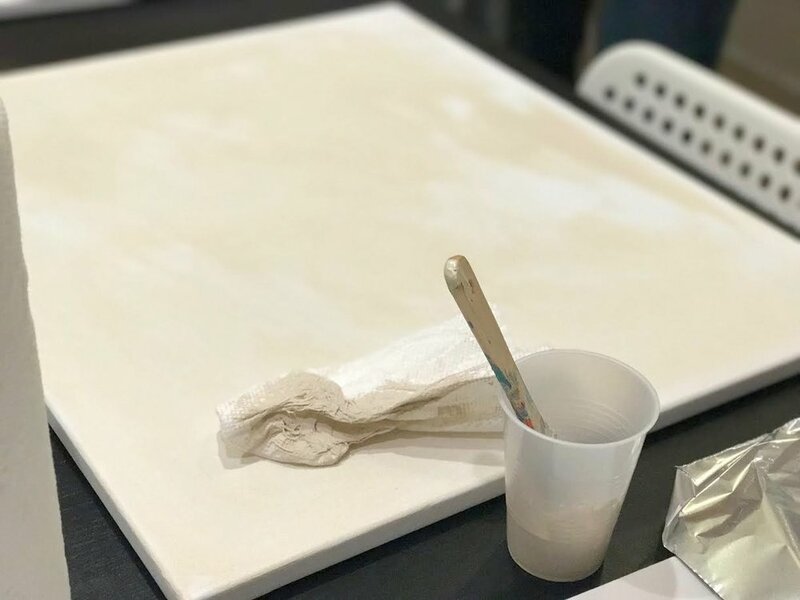 If you're looking for a beautiful piece for your home, or are interested in attending one of Taelor's painting sessions, you absolutely must visit her website and follow her on Instagram! There are big things on the horizon for Taelor, and I couldn't be more proud for my sweet, talented friend!